Lou Reed passed away this past Sunday at the age of 71. As the primary songwriter, guitarist and vocalist for the influential band the Velvet Underground, Reed forged one of the great rock-n-roll careers in American history, lasting over 40 years. The Velvet Underground never sold huge numbers of records or charted well, but Reed managed to remain an important influence and a trendsetter without ever compromising his credibility. That’s no easy feat in popular music, where the hot style can shift several times in a single decade. What I really loved about the Velvets was when the hippies were taking flight in the west, the Velvets took the imperfection of New York darkness, mired in heavy drug use and cross-dressing fashion, out onto a stage for those in the know to see. These were no flower children. Lou Reed, John Cale, Sterling Morrison and Maureen Tucker were the sound of New York’s streets and the late night art-parties their manager Andy Warhol would orchestrate. They were not upbeat. Everything might not be alright. Someone might die. But in the meantime let’s have some drinks and let our fetishes fly. The Velvet Underground, and Lou Reed in particular, were the epitome of New York post-apocalyptic punk. They didn’t need a schtick. They were too cool or too fucked up for all that noise. Just getting them to show up, set their gear up and remotely get in tune was quite an achievement. Their 1967 debut, The Velvet Underground & Nico, was named the 13th greatest album of all time by Rolling Stone, and in 2004 the Velvets were named No. 19 on the list of “100 Greatest Artists of All Time.” The Velvet Underground were inducted into the Rock and Roll Hall of Fame in 1996. My gateway album was Live at Max’s Kansas City, from 1972. It was recorded at the landmark New York nightclub by Warhol associate, Brigid Polk, on a portable cassette recorder, and has about the sound quality one would expect for setting an open microphone on a table in a bar. It’s like you’re there, as the crowd is quite audible, drinks are being ordered and drugs. It’s safe to say, Live at Max’s Kansas City has atmosphere. After getting acquainted with this recording I went back and found Nico, their self-titled record and Loaded. 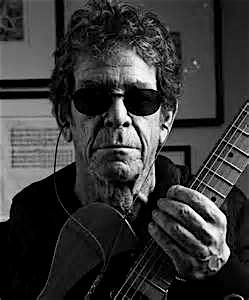 I took Lou Reed with me many places in my head and spirit – and he always served me well. My friend Danny and I got to see him perform once, at Constitution Hall in Washington, DC. It was a chill show, but hit the mark, just like Lou always did. Rest easy my friend – and stay true. This entry was posted in Music and tagged Lou Reed, Velvet Underground. Bookmark the permalink.